Mad. Sq. Music is the Madison Square Park Conservancy’s free outdoor concert series, presenting live music on Wednesdays in the summer. 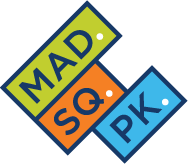 Madison Square Park Conservancy is the not-for-profit organization dedicated to keeping historic Madison Square Park a bright, beautiful and active public park. Madison Square Park in between Madison Ave. & Broadway, from E. 23rd St. to E. 26th St. Above Ground concert series features a list of talented acts from the New York City busking scene. Summer Nights concert series presents free live music Wednesday evenings. Free and open to the public, rain or shine.